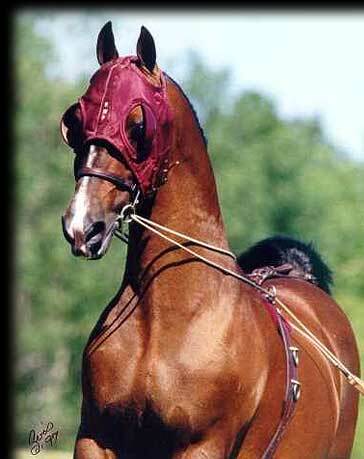 There is one heck of a horse show happening in the heavens. 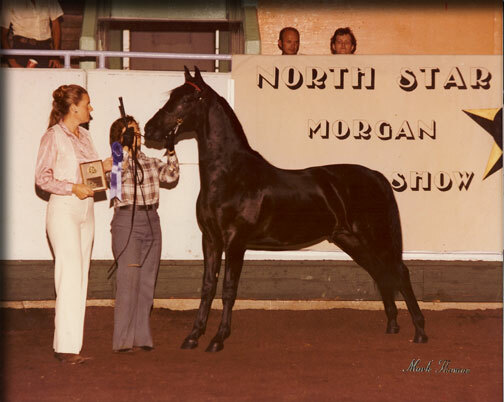 Here we honor Morgans we've bred, owned, shown, enjoyed at home, or that have influenced our lives and therefore the Ridgewood breeding philosophies. Mousing over a thumbnail will bring up a larger image above it. Click on the thumbnail to see the largest version of each photo. 'Ellie' had a tremendous influence on Ridgewood. She was an own daughter of Wham Bam Command and we were elated to get her. We bred her to Tara's Cherokee, crossing back into Trophy and In Command bloodlines, not unlike the Tara Farm program we studied so closely. 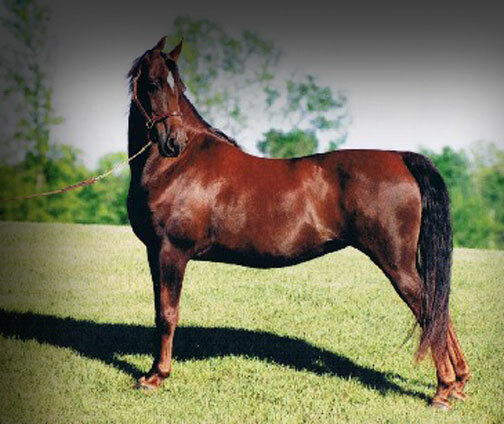 The resulting foal would be named the 2000 World Champion Mare, RWF Noelle. That win with Noelle changed the face of Ridgewood and propelled us to set sail on a new course of breeding excellence, or so it seemed. 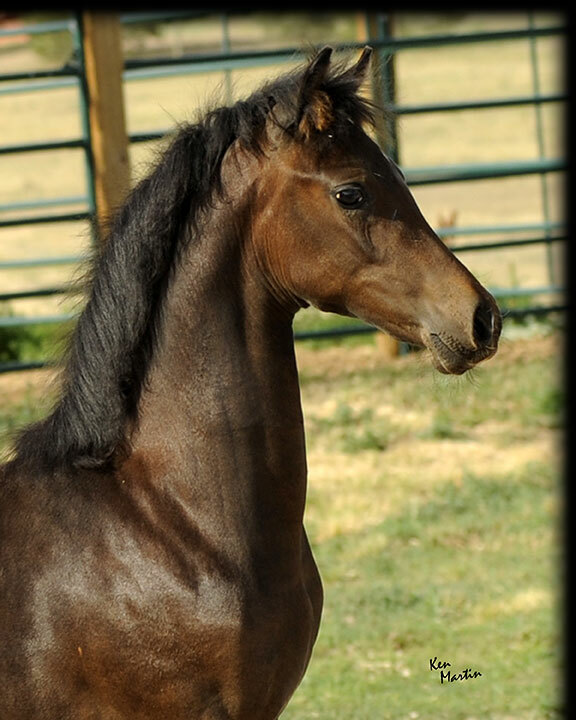 The following year, while she was foaling a bay colt by Cedar Creekharlequin, Ellie died - and in losing her we lost our hearts as well. We miss her as much today as we did the day she left us. 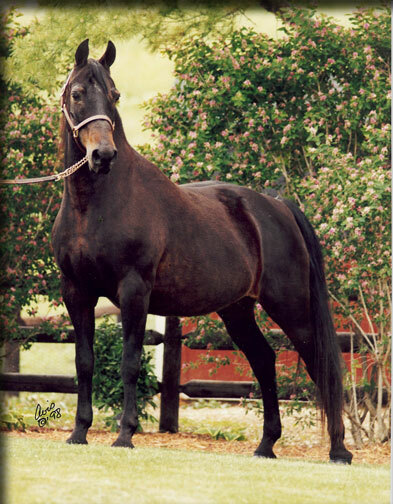 She was a once-in-a-lifetime mare and we are grateful for the short time we owned her. 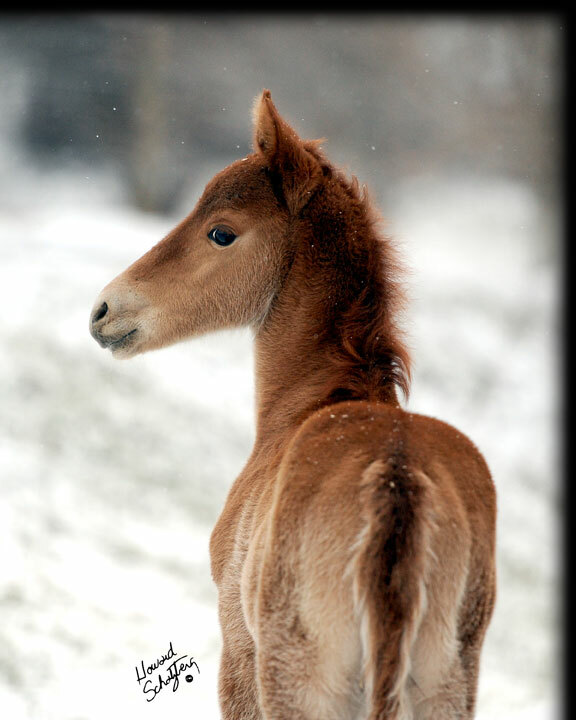 Since then Ridgewood has been re-born, but we remember our foundation mares and hold them very dear. 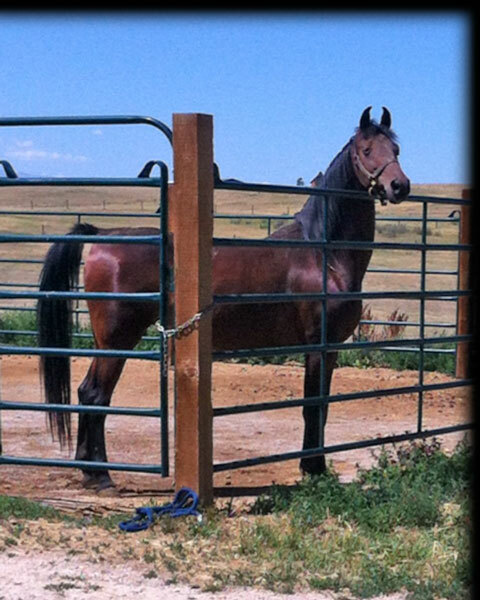 Bea came to retire at Ridgewood in Colorado. She was given to us by Drs. 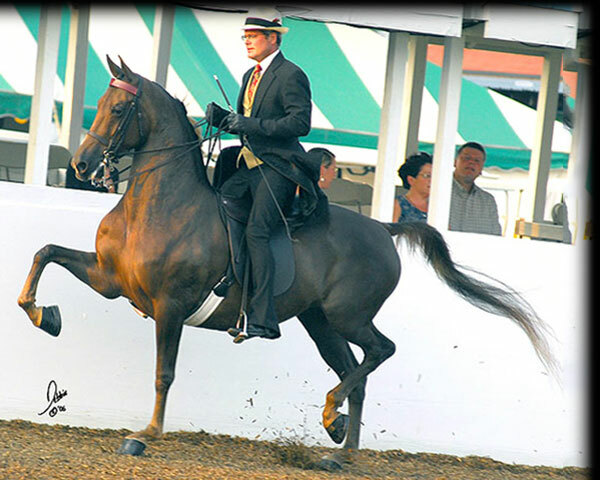 Ray and Allison Bendele to enjoy for pleasure riding around the farm. 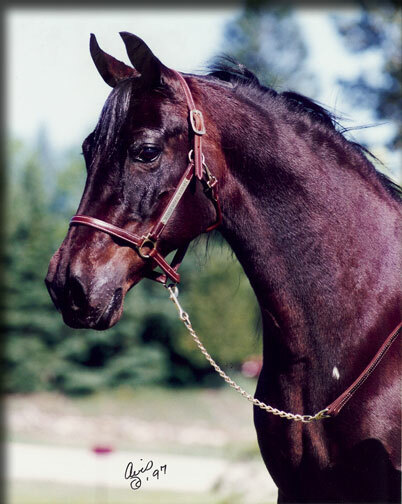 Bea had been shown many times as a Western Pleasure mare and that good training made her a wonderful trail horse. We lost Bea all too soon, but are grateful to have had her for the short time that we did. 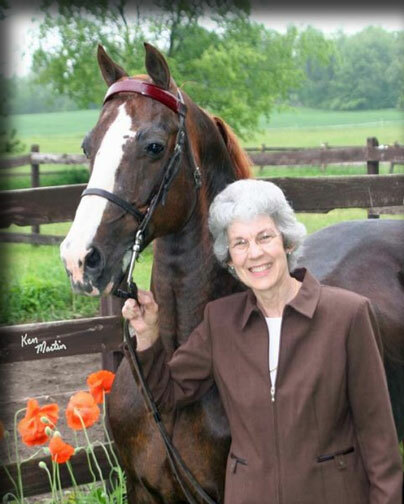 She was a special part of our lives and we remember her fondly. 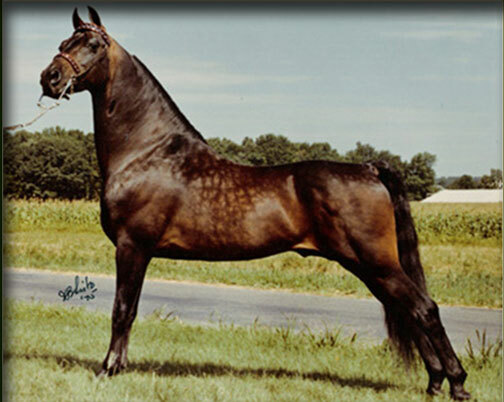 The dam of four wonderful foals by Salem Command, including HFM Rock My World, Back Street Rhythm, Never Surrender, and the winning Jr. Exhibitor English Pleasure Horse Commanding Knight, Majorette is also the dam of FRF Curtain Call (by Serenity Masterpiece) who produced the outstanding FRF Kate Spade, by Mizrahi, for Kurt and Teri Rumens. 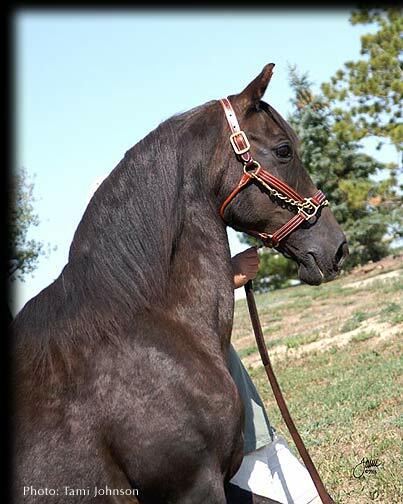 We were very impressed with this big, stretchy mare and her wonderful old bottom line and so we bred her to Queen's Romeo and in 2009 she produced a dark bay colt for Ridgewood Farm named RWF Maestoso. 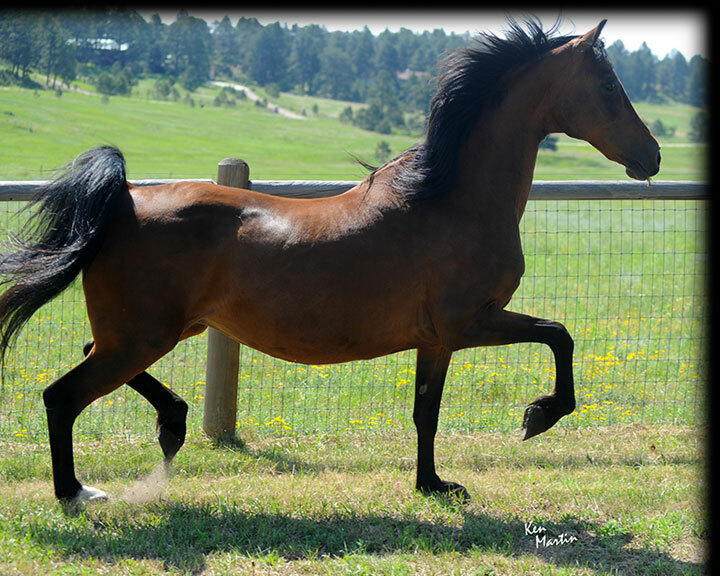 Her last foal in 2012 was a lovely stallion by Master Suite named ES Master and Commander, bred by Dawn Karkoski, who helped Majorette over the Rainbow Bridge in 2012. 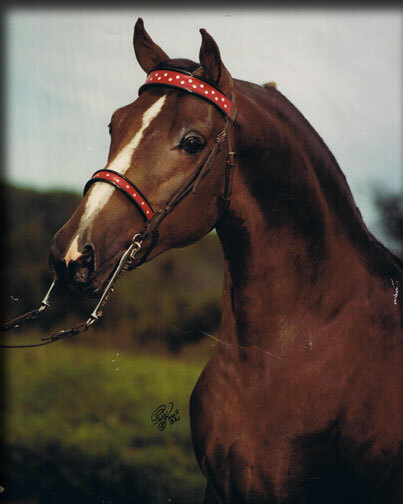 I remember walking past her stall at the Jubilee show and thinking she was the most beautiful yearling I had ever seen. 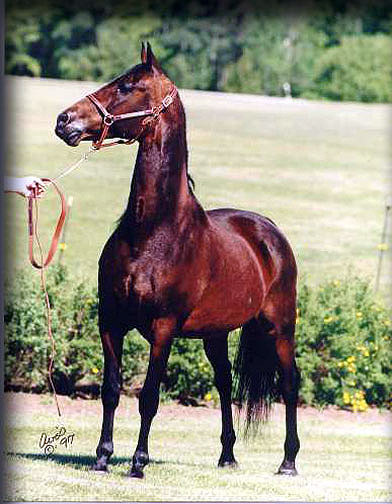 She was sired by Beamine and had his trademark huge eyes and tight swivel ears. She was, in every aspect, exquisite. 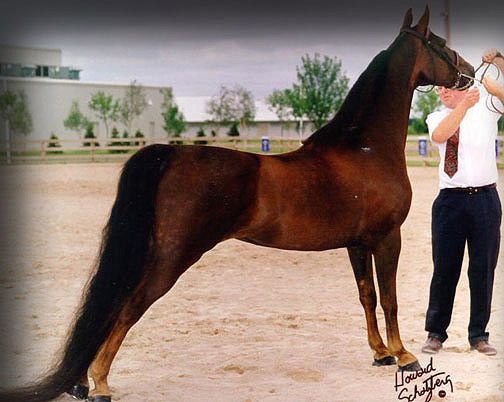 At the time, she was owned by Jaklee Farm in Lake Geneva, Wisconsin. 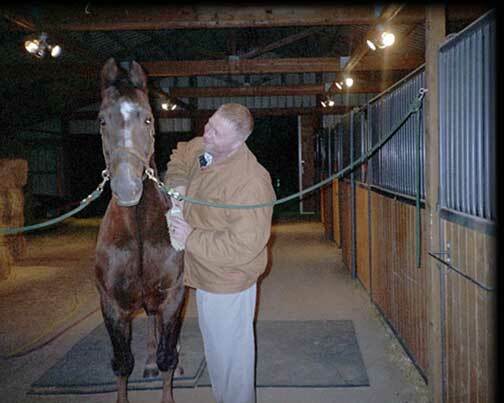 Steve Quaid was her trainer at the time and also a mentor and friend of mine. 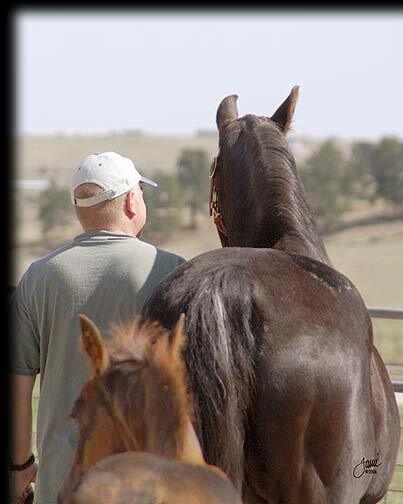 Years later, when Jaklee Farm was dispersing most of their herd, Steve made Bealoved available to me. For Ridgewood she produced RWF Dearly Bealoved by Irish Ebony. 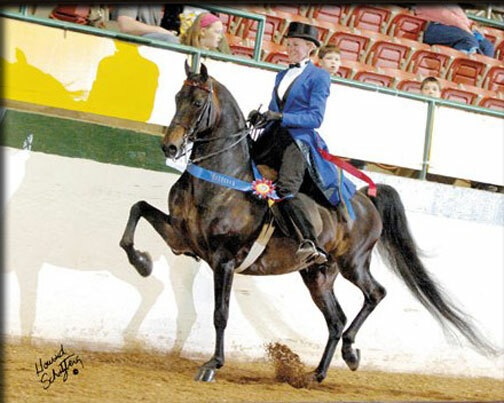 We lost her to a brain tumor, an untimely death for a very elegant mare. When I'm thinking of Bealoved, I'm taking a walk down memory lane. She was very special to me. 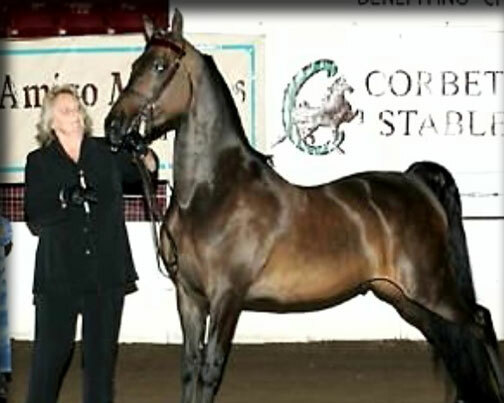 When Beaming Beauty became available for sale via auction, I was excited. 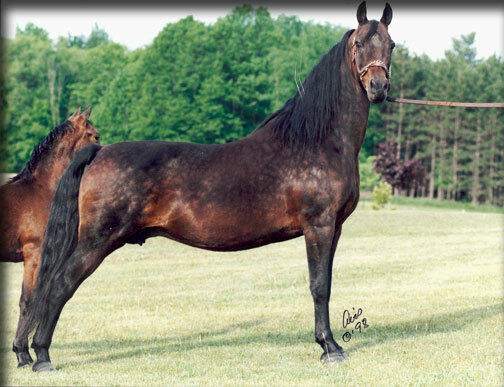 We had owned her full sister and full brother and an opportunity to purchase Beauty was a dream come true. 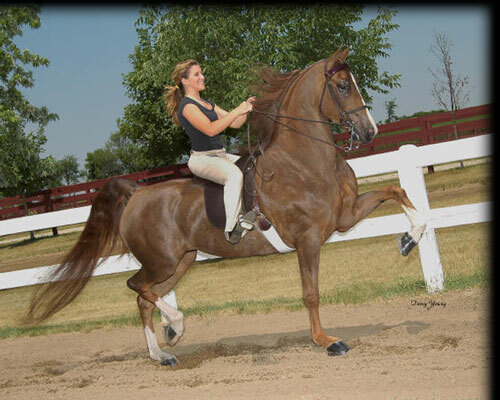 We quickly made arrangements to purchase her prior to the sale and she came to make her new home in Michigan. Beauty was as lovely as her photos suggest. 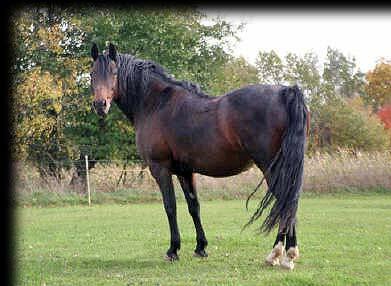 She was a big mare and absolutely beautiful. 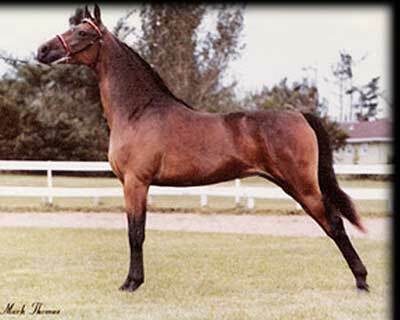 For Ridgewood, she produced one foal, RWF Lord Of The Dance, sired by Valiant Tony. 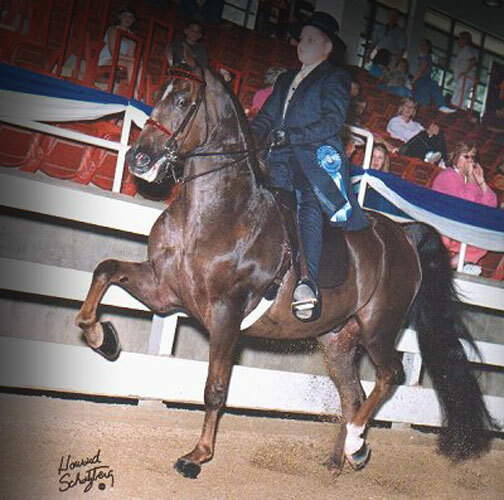 Lord Of The Dance is owned by James Ivorie Fors in Pittsfield, PA.
We feel fortunate to have owned Beaming Beauty and feel blessed that such a lovely mare was able to spend her golden years under the expert care of Jan Currie at Elysian Fields. 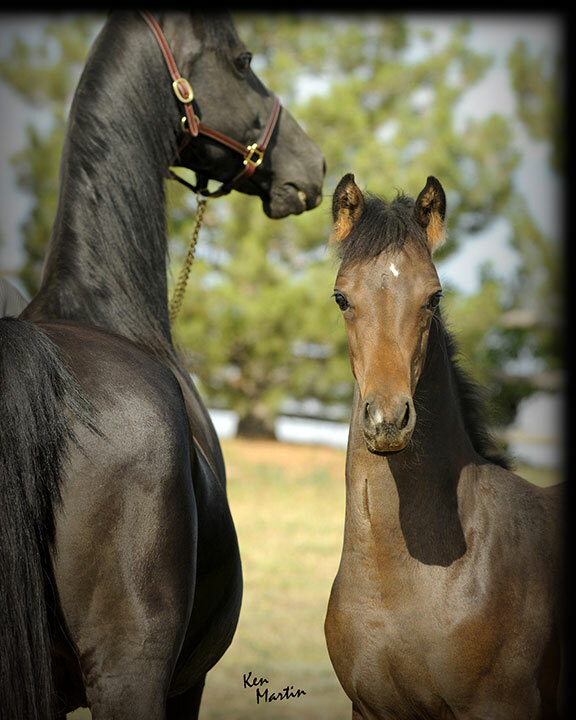 We have admired Bella Prima and her produce in the Copper Beech program for years and are grateful for the opportunity to have her produce foals for Ridgewood. 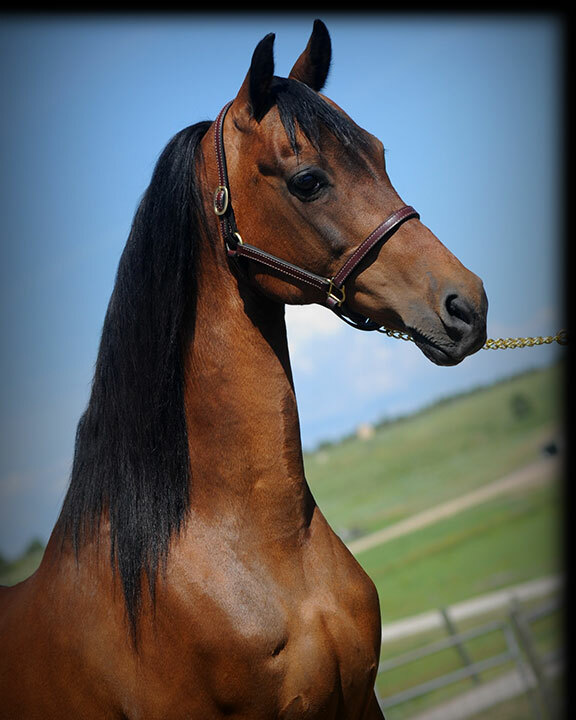 Sally is out of a full sister to WC Centerpiece, and she is a 3/4 sister to One And Only (currently in the Schengrund breeding program), MKS Just Cause (dam of Diablo In Red and currently in Schendgrund's breeding program) and Prediction (dam of AWS Icon and AWS Fruition). 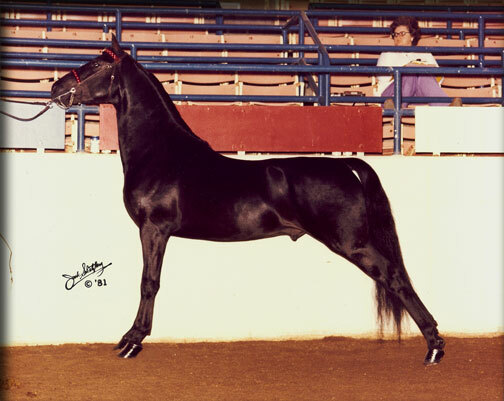 Sally is also a paternal sister to the World Champion Mares Flawless and Decadence. 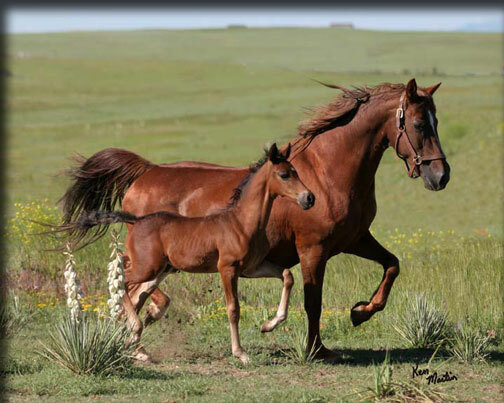 Our plan was to breed her to one of our young stallions in the future, however her life was cut short prematurely. He was with us such a short time - just months - yet his unexpected passing brought incredible pain to our lives. We will never forget the joy he brought to us, his stoicism through pain he did not let us see, the passing of a legend. 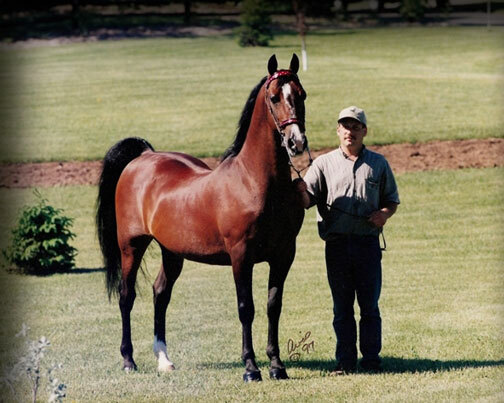 Brief Encounter won multiple World titles for the Galatz family and later Tara Farm. He came to Ridgewood to retire. 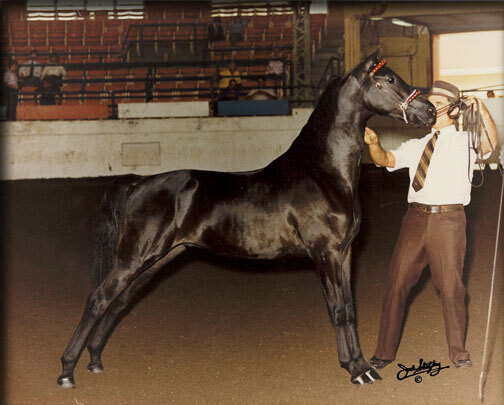 We planned a retirement party for him at the Circle J Horse Show and he attended as though he were the king. The very next day, he was gone. Goodbye, dear friend....we will NEVER forget you. We waited a long time for the opportunity to purchase Evensong and were very happy that she was a part of Ridgewood. 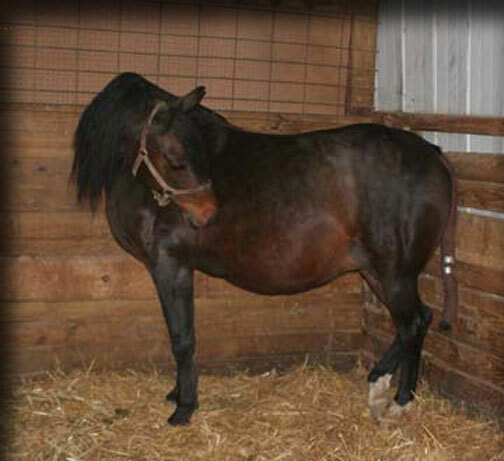 Unfortunately, we lost this wonderful mare on April 9, 2012 due to an enterolith rupturing her small intestine. Rest in peace, Evie. We loved you so much! 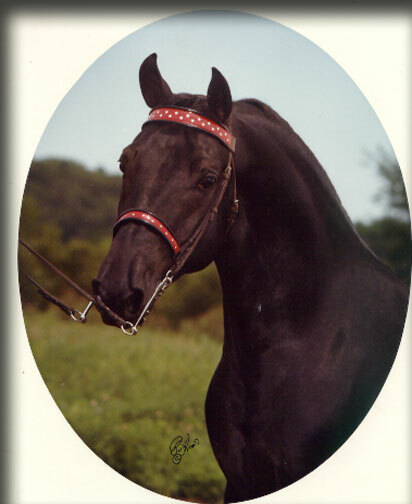 Elana was sired by one of our favorite stallions, Sorento, and out of the good producing mare, Brentwood Lady Lea. 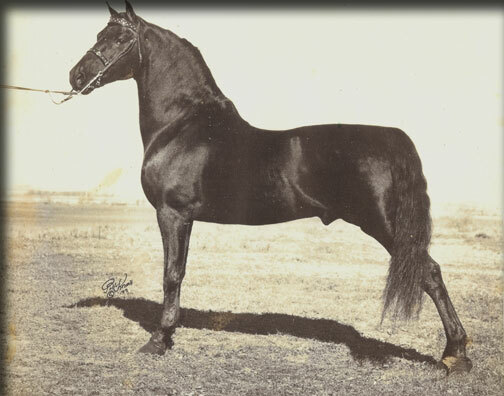 She also carries the distinction of having produced the first RWF-bred World Champion, RWF Victorious, by Duke of Wynne. 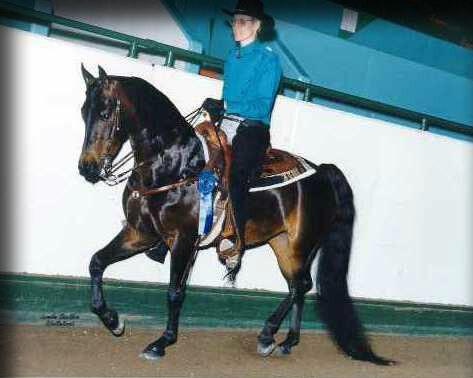 Elana was a typey mare with a great shoulder and a lot of talent. She passed these traits on to her produce, of which there were far too few. 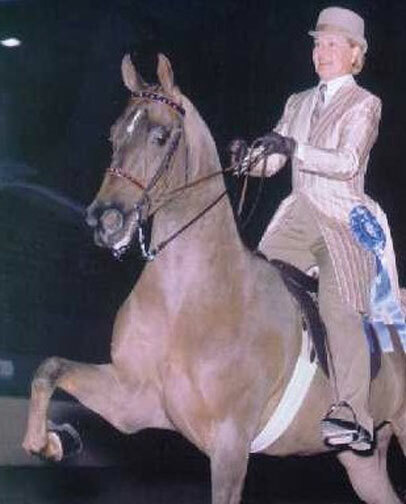 She was a foundation mare for Ridgewood and one that we revere even to this day. 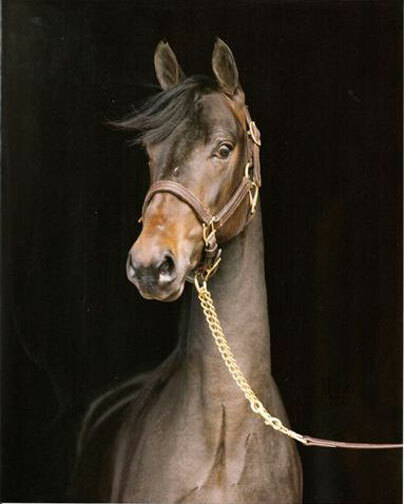 We were fortunate to acquire Nobelle Prize as an aged mare. 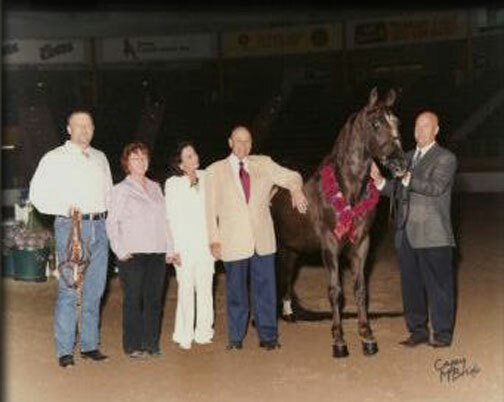 Among her notable get are Futurity's Touch Of Harley, one of the foundation mares for Kevin Schengrund's SSLLC breeding program, Boston's Big Whammy, a titled show horse currently owned by Debra Hurst Walters, and World Champion Futurity's Miss Munitions who is sired by Tug Hill Whamunition and owned by the Dodson family. The video clip here is of Miss Munitions' daughter by WC Stonecroft Trilogy. 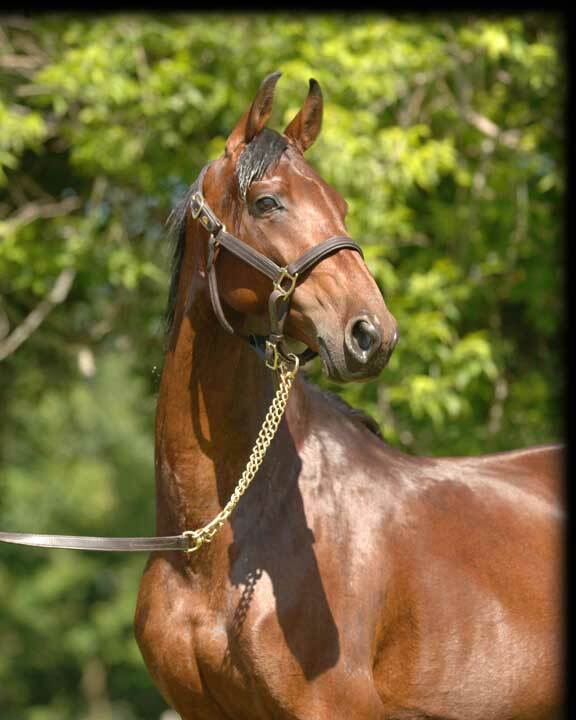 Worthy to note is that Nobelle Prize is a full sister to Futurity French Command. 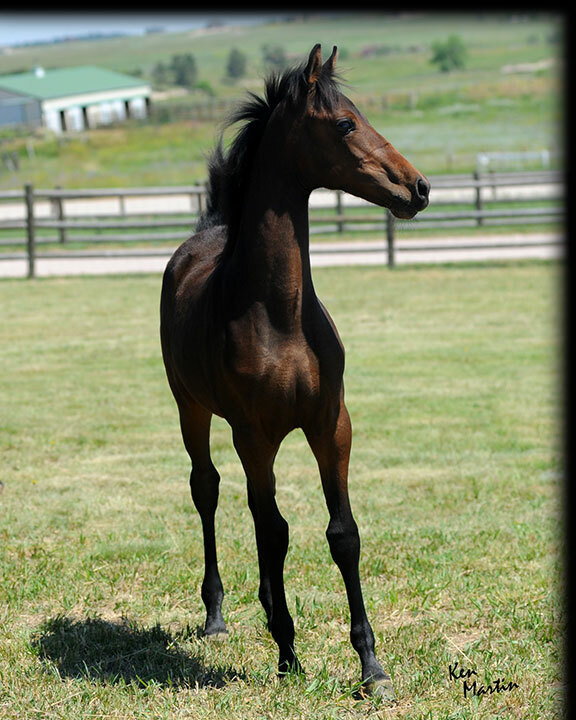 Prize produced a beautiful bay filly by DBA Street Talk in 2012. 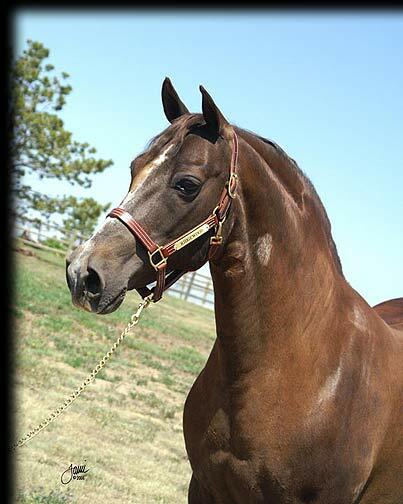 Unfortunately, we were forced to say goodbye to this wonderful mare on October 18, 2012. She is sorely missed at our farm. His name morphed from 'North Born' to 'Nanook of the North' to 'Nook.' And he was a blast. 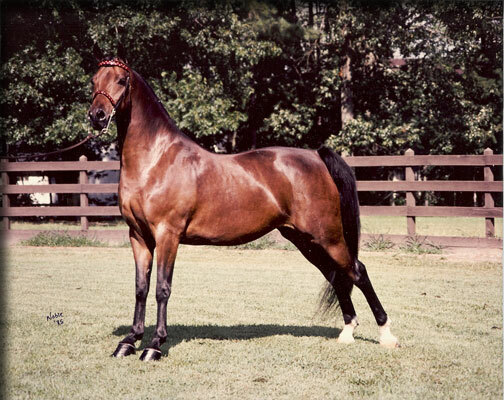 We bought him in utero and he carried the HF prefix (Harmonette Farm) as that was the precursor to Ridgewood's RWF. 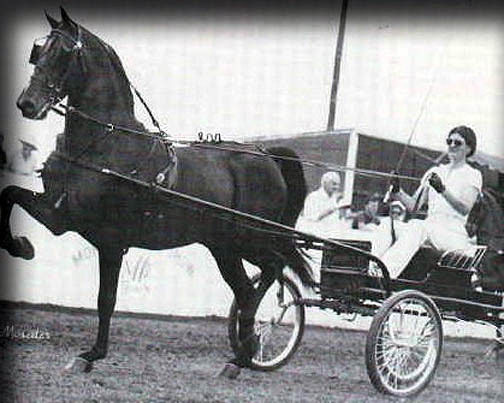 Scottie Matton showed him for us in two year old park harness and despite his airs above the ground, was able to keep him between the shafts long enough to win a class or two for us. 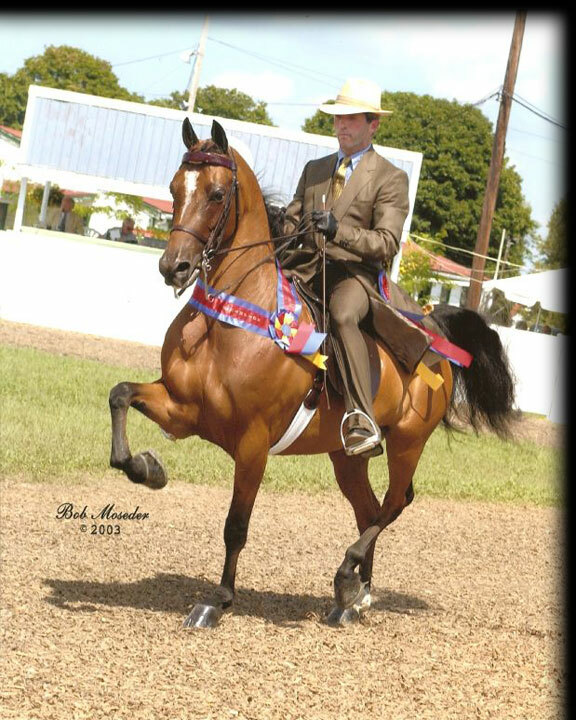 We sold Nook to Shamrock Farm in Kentucky, where he became a National winning show gelding for Ashley Taylor Wilson and her brother, Ethan. 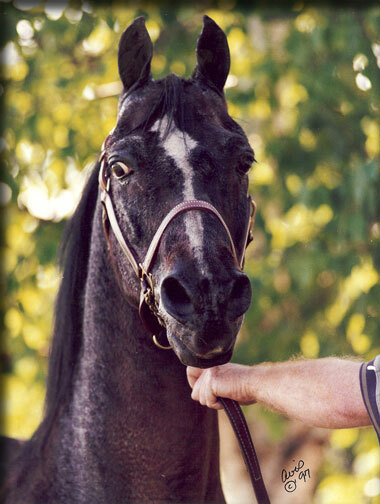 In that role, he was a very special horse and I believe he died at Shamrock Farm--a beloved member of their family. 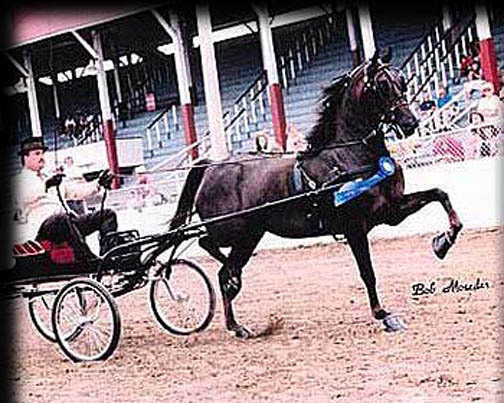 'Natalie' was a full sister to HVK Vibrance and HVK Man About Town, all being out of the Wham Bam Command daughter HVK Radiant. 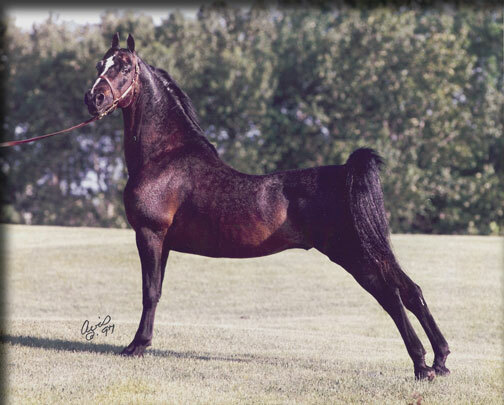 Wham Bam Command has played an important role in our breeding program through the years, as we revere the Trophy/In Command crosses. Our thanks to Copper Beech Morgan Farm for the opportunity to purchase this great mare and give her a home for her last years on earth. She thankfully left us a beautiful 2015 filly to replace her, RWF Vergara, by Mizrahi. 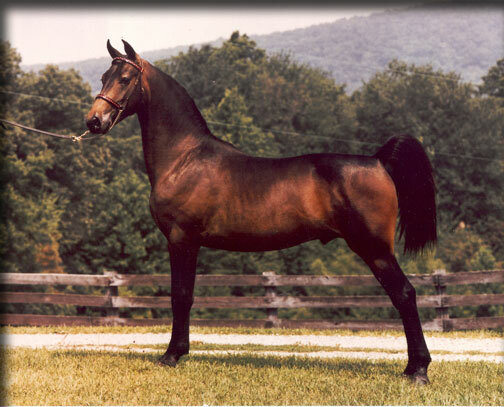 I met 'Sadie' at Country Manor Farm in Cannon Falls, MN as a yearling. 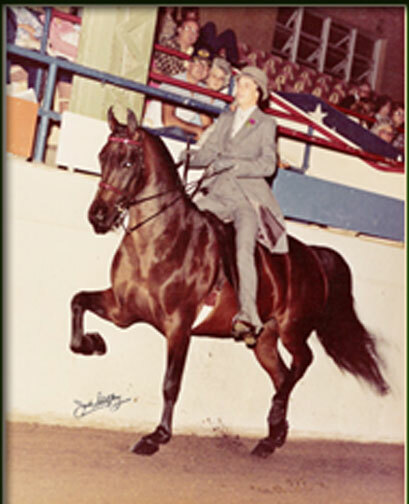 Jackie Millet, now Sweeney, owned CMF before it later took on the name of it's predecessor, Hylee Farm. 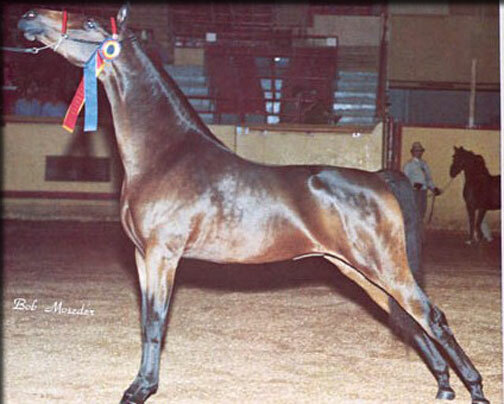 Sadie was an impressive yearling and you could pick her out in a pasture as the most beautiful, the most upheaded, the most talented. 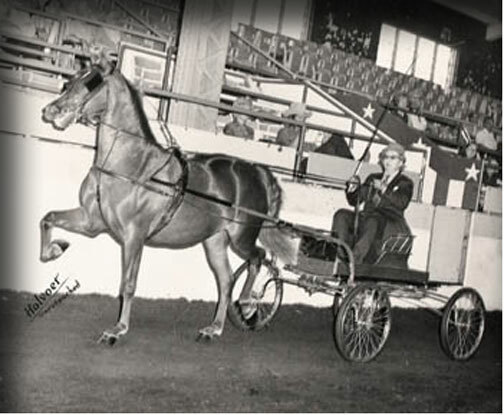 She went on to storm the show ring by winning a World title in Oklahoma in Two Year Old Park Harness. Years later, Sadie came to Ridgewood through the generosity of Bob and Debi Boies, Landrum, South Carolina. 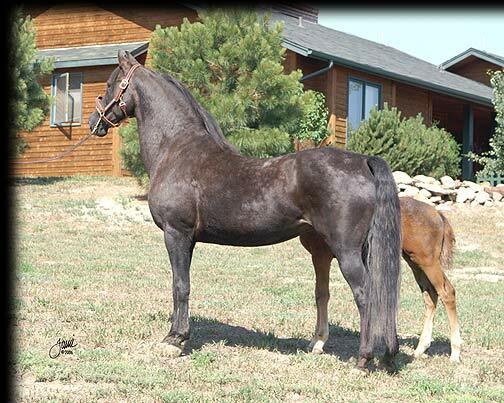 She had one foal for us, RWF Tuscany, before her much-too-early death. 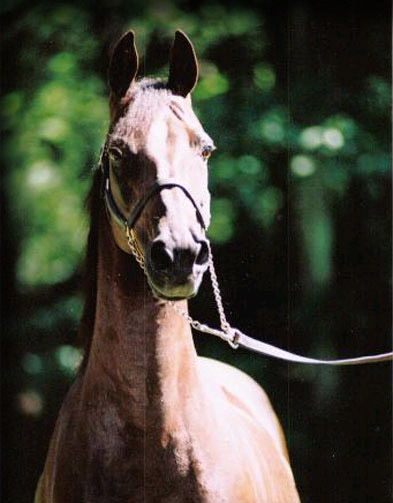 We were fortunate to have her full sister, Hylee's Dirty Dancing, in our group of mares for a short time. She is different than her sister, but there is no denying the family resemblance. 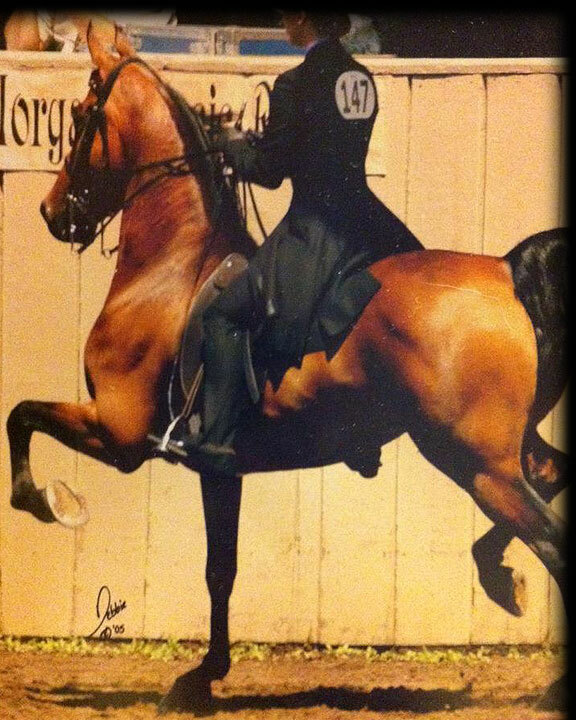 'Tina' holds a special place in our hearts, as she is the mare that served as the foundation for our love of producing Morgan horses. 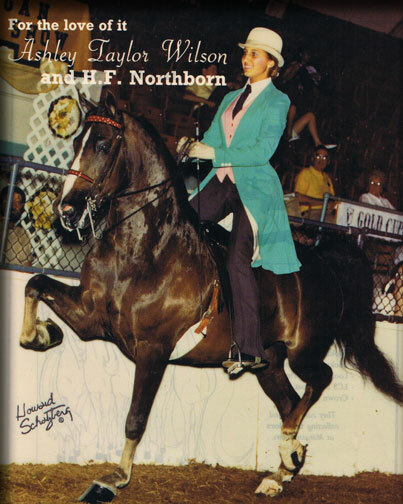 For us, she produced Thunderbolt TBM and Northernaire--both by Rimlo Black Valiant. 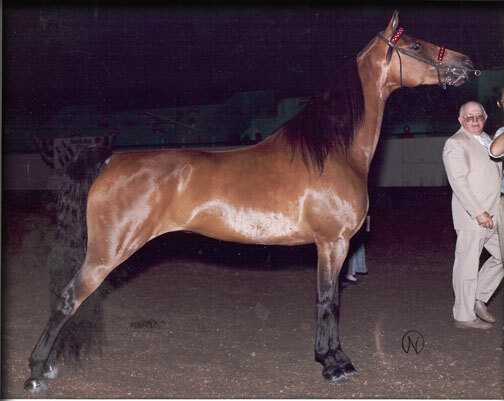 In addition, she produced the winning show gelding Flaire De Lark by Waseeka's Skylark and the first Morgan to carry the RWF prefix, RWF Kristina, by Irish Ebony. 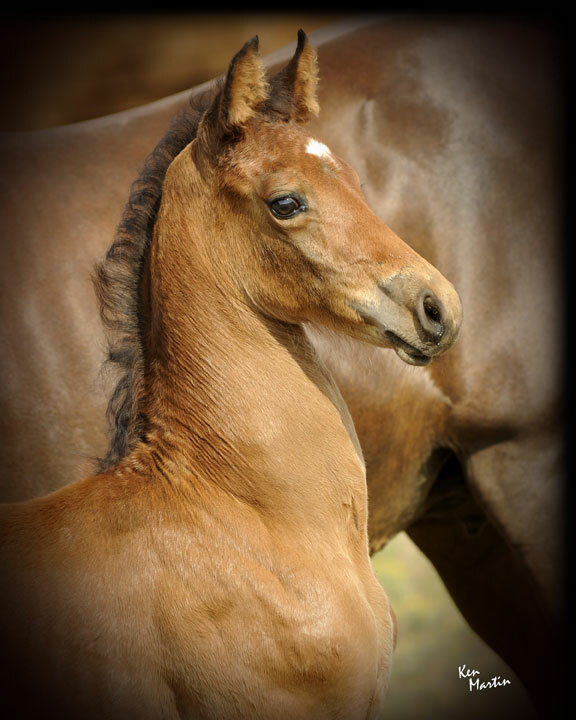 She also produced a lovely chestnut filly by Sorento that we named RWF Best Of Times. Mention Tina in the presence of myself or Jake Hendzel and you'll get the same instant response--'she was the best of the best.' We loved this grand old mare. 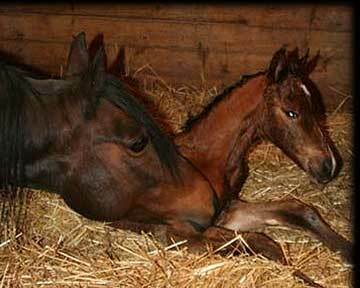 Beauty left us much too soon, but prior to her passing she blessed us with two wonderful foals. They are World Champion RWF Paganini and the up and coming prospect, RWF Whamerican Beauty. 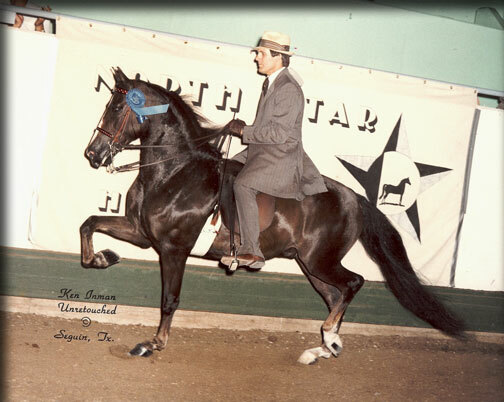 Paganini, sired by Beethoven, won the World Champion Junior Gelding Championship as a yearling in Oklahoma. 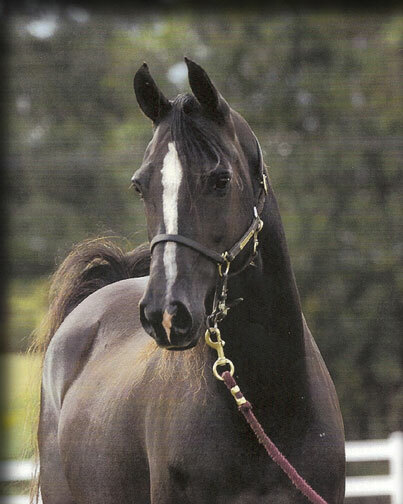 Whamerican Beauty, now two, was recently purchased by Mountain Aspen Morgans as a show prospect and future broodmare. 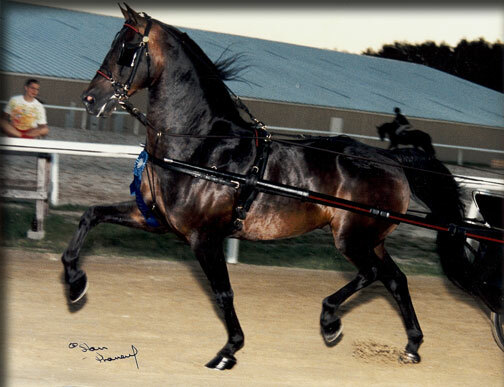 When Beauty died, she was under the vigilant care of the Martin family and Aljak Acres. For those of you who have seen Aljak Acres, you know she passed while enjoying a little slice of Heaven on earth. We are blessed to know she had such wonderful care in her final days. When we were first into Morgans, we fell in love with the Beamington offspring. 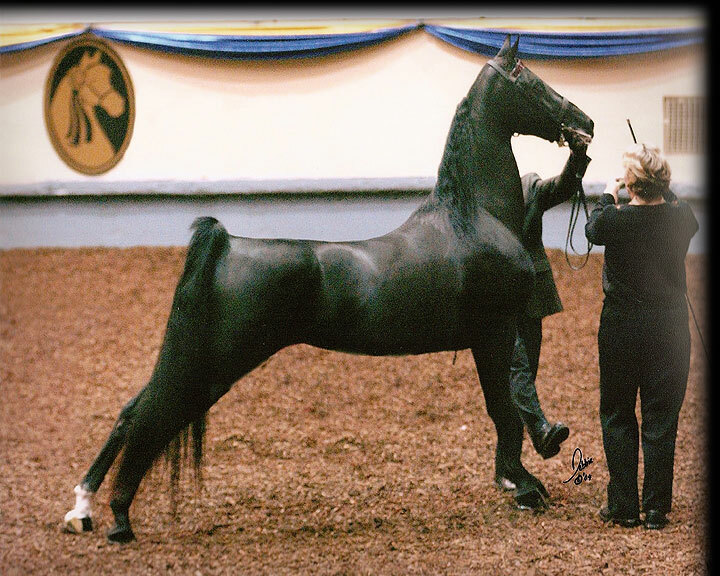 We had seen Irish Ebony as a yearling at the Jubilee Regional Show and were later able to purchase him as an adult stallion from the Dodson family. 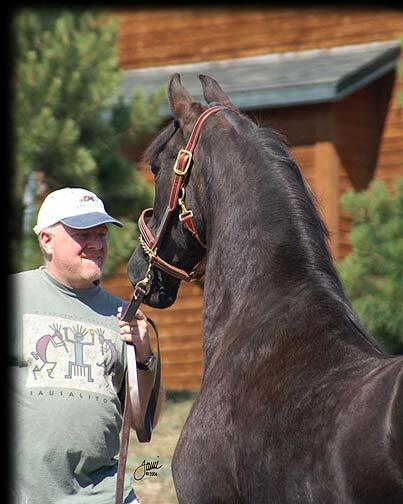 He sired several foals for us and some of our clients before we sold him to Dave and Carol Allen in Wisconsin. 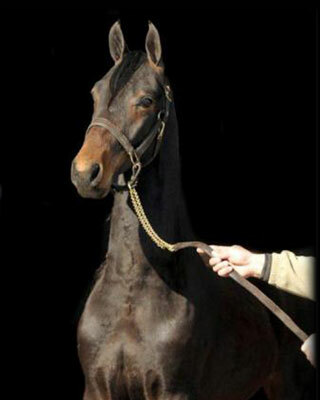 In addition to Ebony, we owned his dam, Irish Ecstasy, and his sisters, Irish Oh My and Beaming Beauty. We tried hard to buy Irish Elegance, too, but couldn't quite get that done! 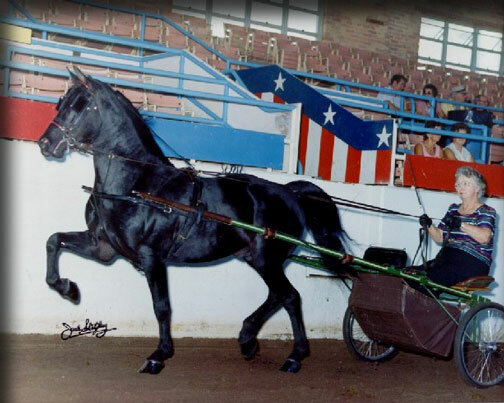 It was a family affair--the 'Beamingtons' bring back wonderful memories of our early days with the Morgan horse. 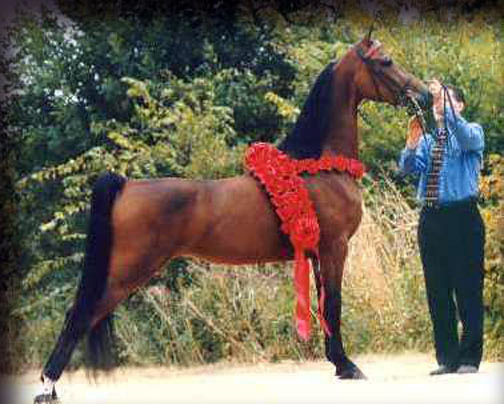 To have had the opportunity to own Ecstasy was an honor. 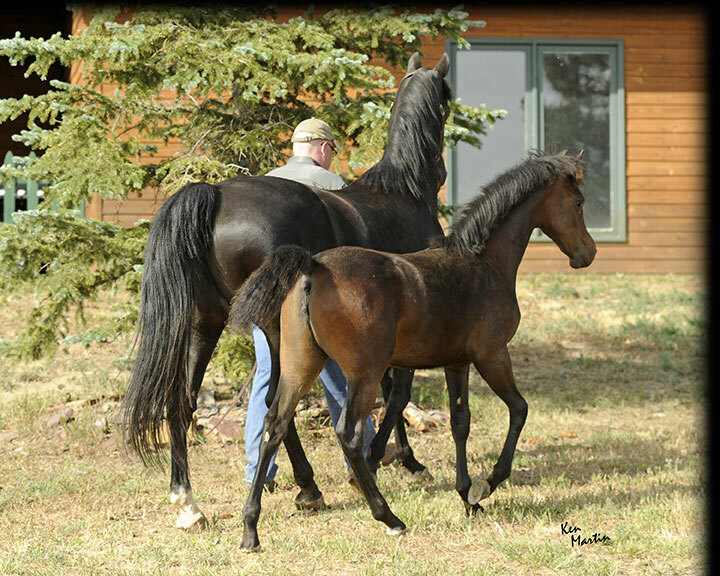 Through our pastures had passed Irish Oh My, Beaming Beauty, Irish Ebony, all by Beamington and ultimately the foal 'Stasy' was carrying when she came to us, FCF Anastasia, by Sorento. 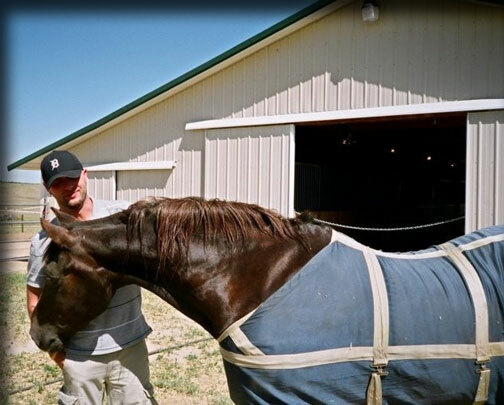 We are blessed to have had Stasy spend her final years with us at our farm in Michigan. She was extraordinarily elegant. 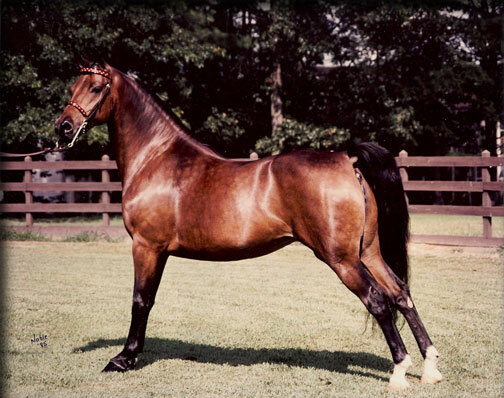 Her fourth offspring by Beamington, Irish Elegance, was most reminiscent of her dam. 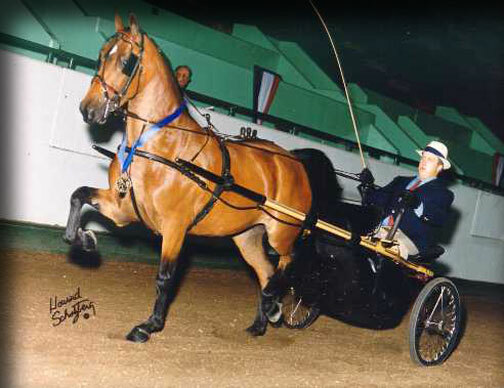 I remember Doris Ryan telling me Oh My named herself - those were the first words out of Doris' mouth when she saw the newborn at the side of her dam, Irish Ecstasy. 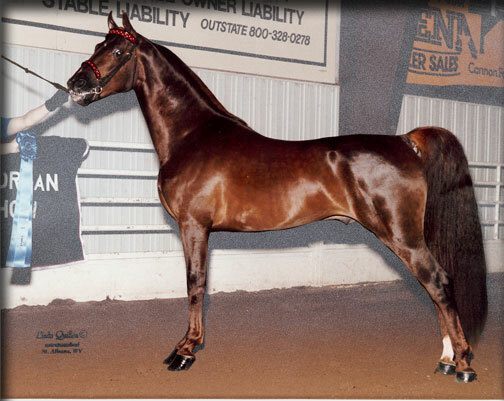 Oh My was the first yearling to win the National Futurity class in Oklahoma with her handler, Steve Quaid, for Jaklee Farms in Lake Geneva, Wisconsin. Oh My and Bealoved were two fillies at Jaklee Farm that I loved and I'm so grateful they eventually spent time at Ridgewood. 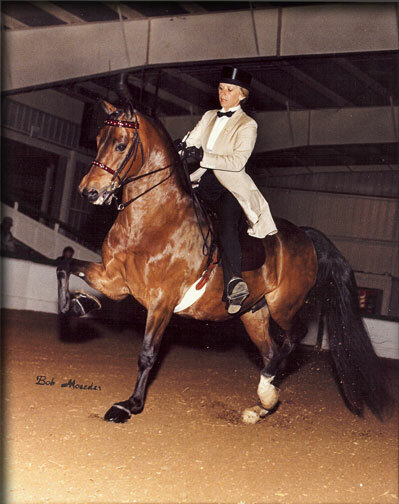 It was Irish Oh My and her siblings, along with Bealoved, that serve as the foundation for my lifelong love of breeding Morgan show horses. Another great filly by DBA Street Talk, we considered Bellalucia to be one of our very best. 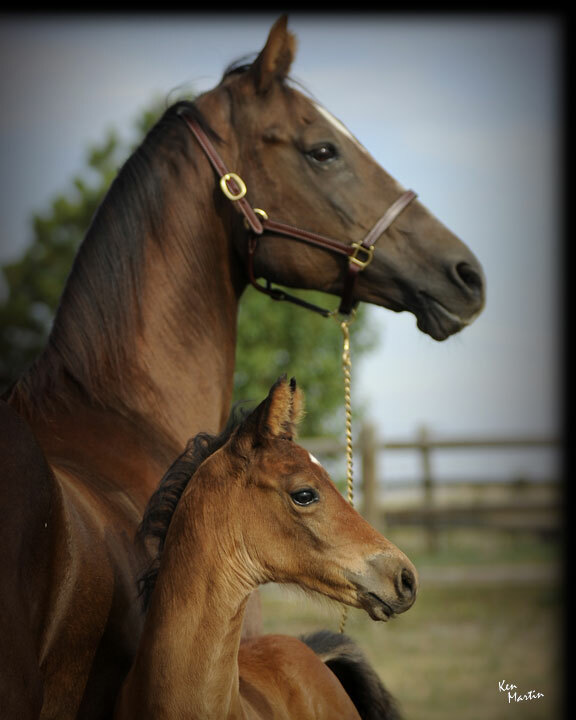 She was a stunningly beautiful baby and the last foal from her world-champion producing dam, Futurity's Nobelle Prize. 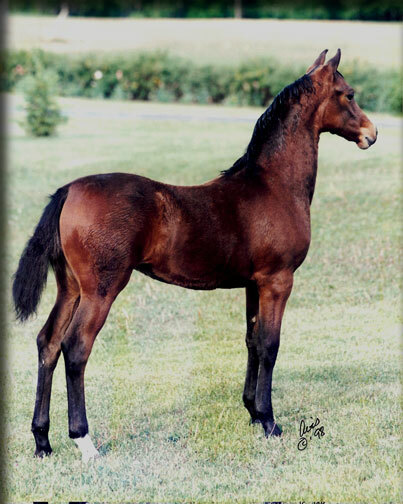 Quick to the draw, 'Zelda' was purchased as a weanling by John Suprenant and Charlene McCarthy of Paragon Morgans in Pelham, NH. Unfortunately, she was lost tragically young. 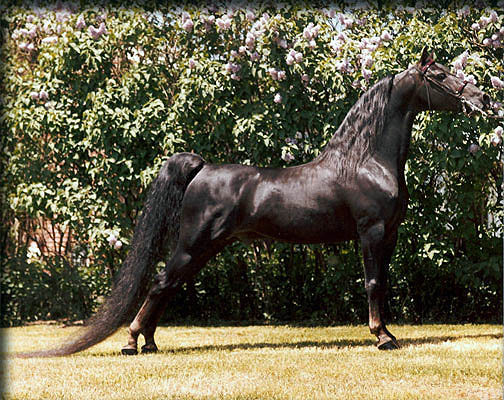 We've never sold a colt as fast as we did 'Carlos.' He was three days old. We had photos that Ken Martin had taken for us. I showed them to Debra Hurst and she said she wanted him. I said he was expensive and she wrote the check. The deal took less than five minutes. Amazing, but not as amazing as Carlos was as a baby. Unfortunately, he died much too young, so he never realized his full potential. 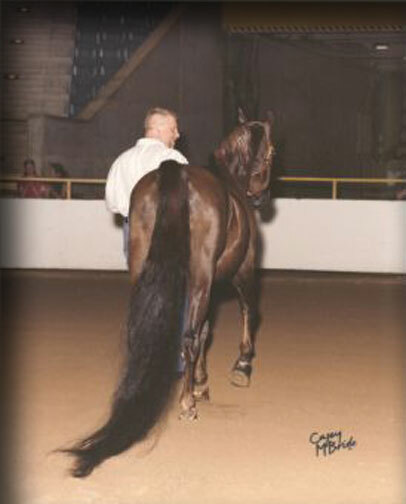 To those that knew him, he was a special colt. His early death remains a disappointment. 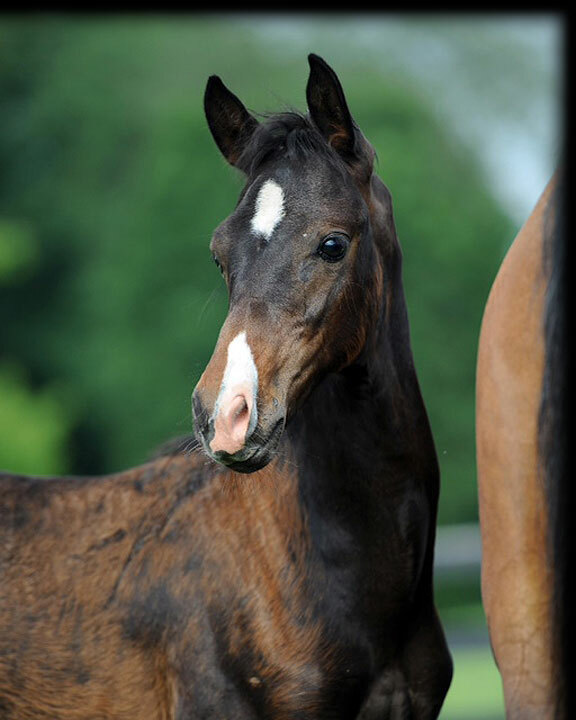 "Violet" was the first born foal at Ridgewood in 2012 and is also the first foal that Halle Berry had for us. 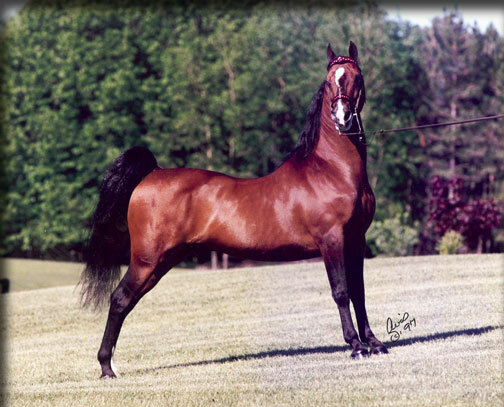 Her sire is AFF Leroy Brown, who is also the sire of World Champion Bada Bing. 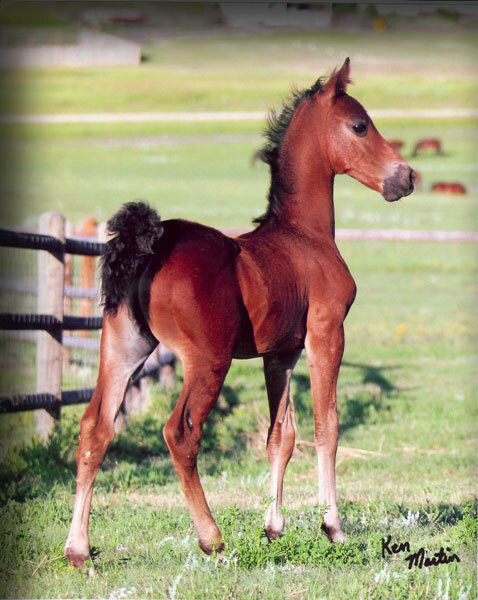 We lost Violet to colic at just four months of age. 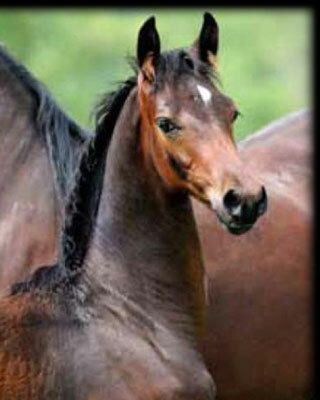 She was a beautiful filly and we were blessed to have her in our lives, even if only for a short period of time. 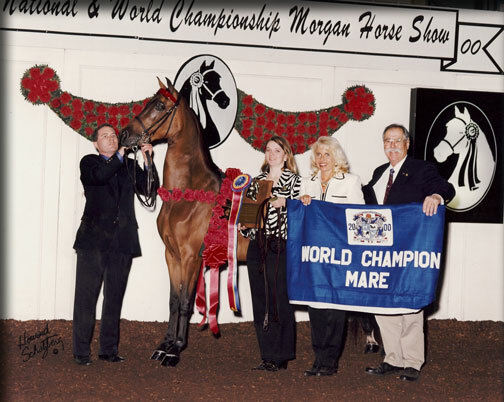 We call her our Millennium Mare, as Noelle was crowned World Champion Mare at the 2000 Grand National & World Championship Show. 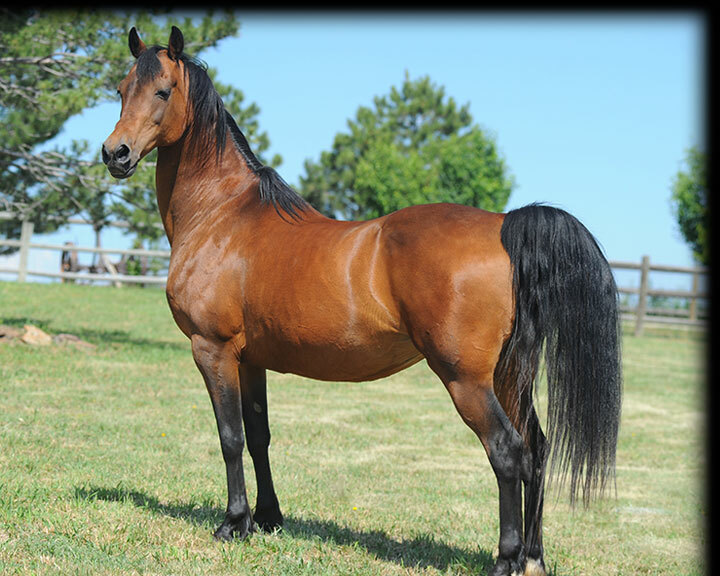 Sired by Tara's Cherokee and out of a Wham Bam Command daughter, Noelle is the Ridgewood culmination of years of studying the Tara Farm breeding program. Her pedigree is rich in the blood of Trophy and In Command. 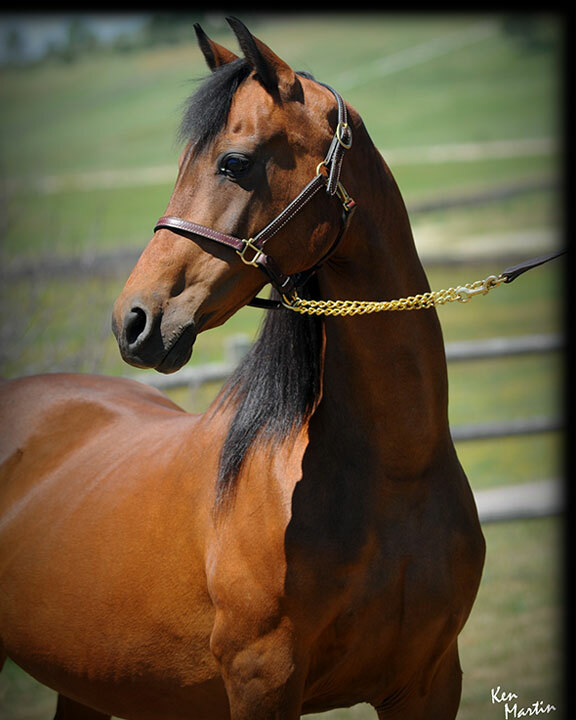 We are honored to have bred such a beautiful mare and pleased that she has returned to the broodmare ranks at Ridgewood Farm. 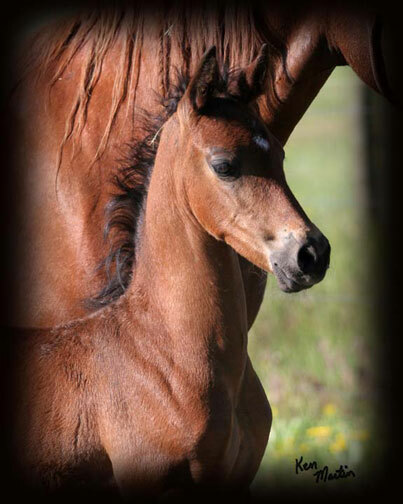 Noelle delivered a bay colt by Cedar Creek Flambeau on June 29, 2014. We named him RWF Jack Black. 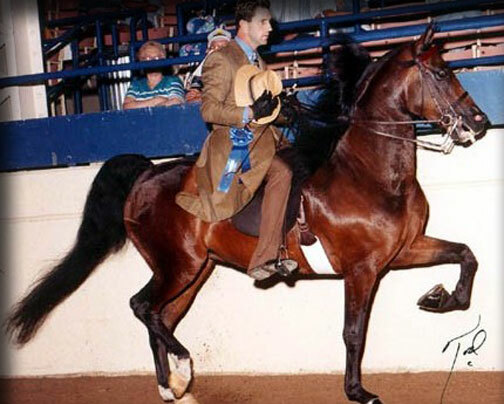 There is no moment of greater joy than when a horse carrying your prefix, that you have bred and have loved, steps into the coliseum in Oklahoma City and gives your farm it's first World Championship title. 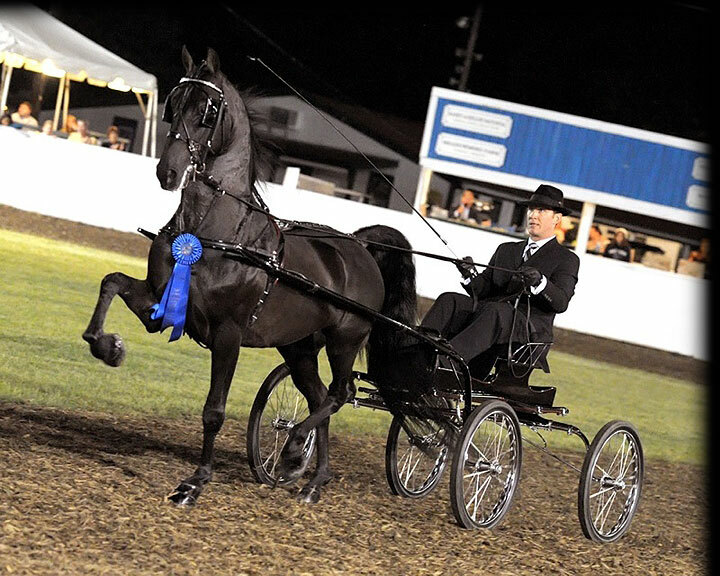 This outstanding gelding stepped up to take the Two Year Old World Champion Park Harness Championship title and we are extremely proud of that accomplishment. 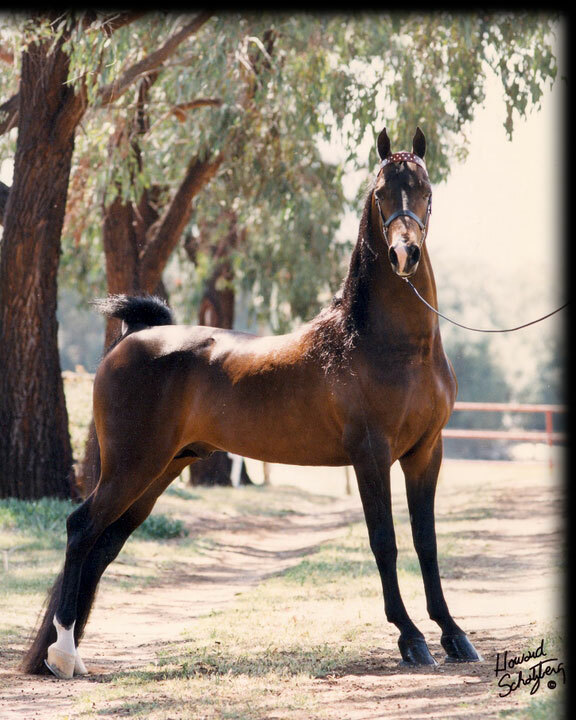 'Vic' was sired by Duke of Wynne and was out of our great mare, FCF Elana. The thrill of that moment can still excite me today. 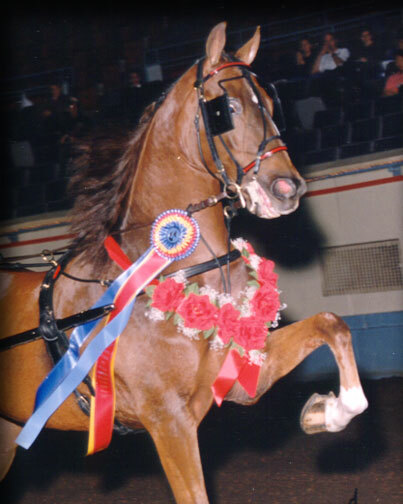 We've bred World Champions since, but there is no thrill as exciting as the first. Thanks for the memories, Vic. We salute Tara's Cotillion as she was our initial introduction to Tara Farm and the beginning of a friendship that continues today. I first saw Cotillion at the Morgan Grand National when she was just two years old, and went to visit her in her stall. 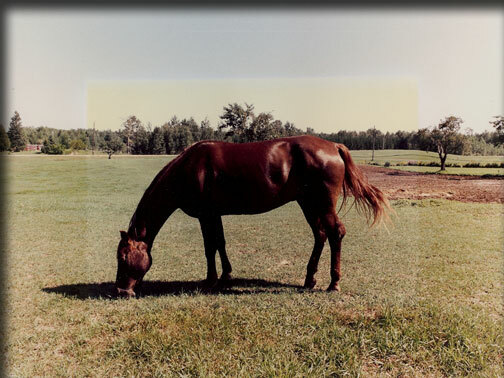 I continued my following of the Tara Farm horses for decades and feel my study of their breeding program has helped shape the decisions we make in the RWF program today, relative to effective linebreeding. 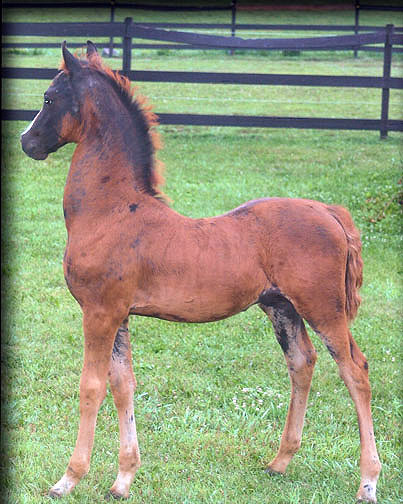 Cotillion came to Ridgewood late in life and produced just one foal for us, RWF Dances With Wolves, a bay colt sired by one of our favorite Tara Farm stallions, Tara's War Paint. 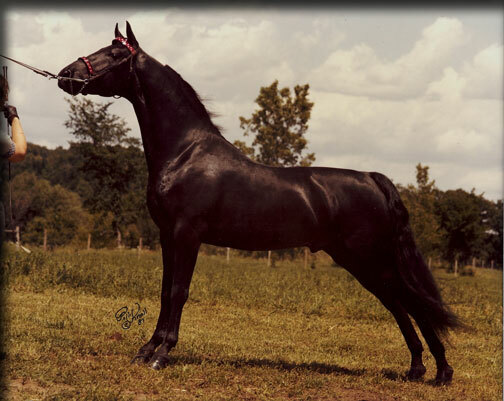 T-Bolt was an impressive black stallion son of Rimlo Black Valiant and our foundation mare, Hylee's Justintime. 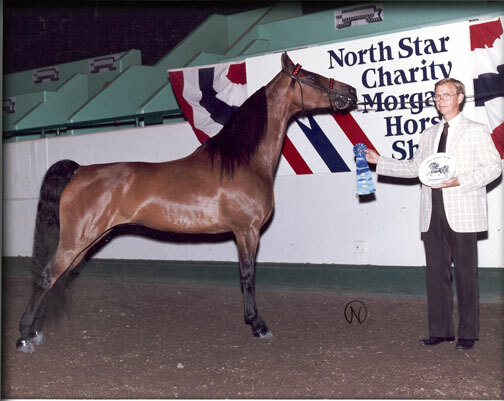 We had great fun showing him as a yearling at the North Star Morgan Show and winning the yearling futurity there. 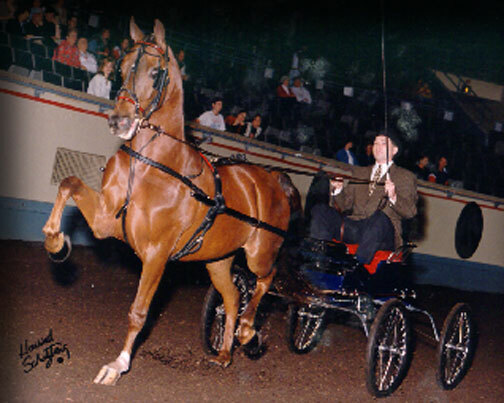 We also showed him as a two year old in hand and in harness very successfully at the regional level--Jackie Sweeney was his trainer. T-Bolt died of a twisted intestine late in his two year old year and we were devastated. 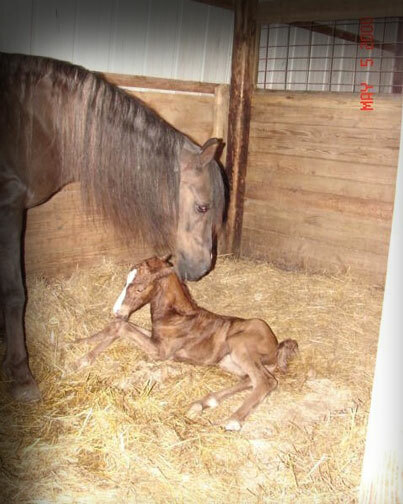 It was our first experience losing a horse to colic and a very painful process for us. We have fond memories of Thunderbolt even though he was with us for a very short time. Most people who know Morgans and have been around for a good long while remember Wynne Commotion. He survived a fire in Michigan and endured burns across the majority of his body. 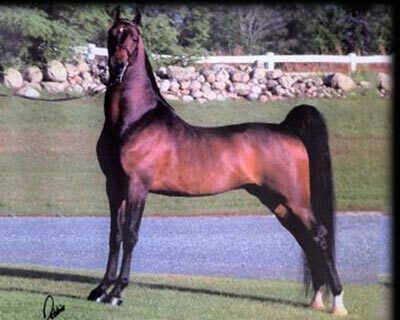 A good sire of show horses and broodmares, he sired 66 foals before coming to us late in life. We spoiled him, keeping him knee-deep in straw and shrouded both summer and winter in blankets that would protect him from the sun and the snow. 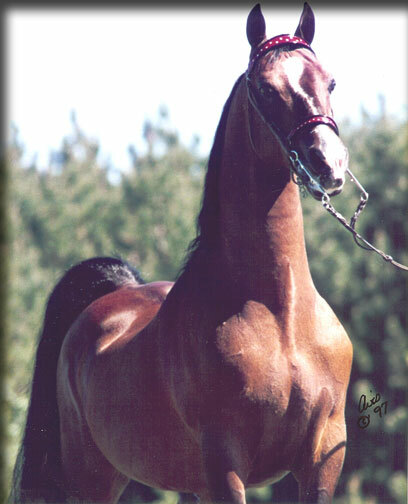 A beautiful son of Waseeka's In Command, we include him here in tribute to his greatness of heart. We were blessed to have him at Ridgewood and in our lives.